Mexico's incredible Baja Peninsula stretches seven hundred and seventy five miles from Mexicali to Cabo San Lucas. This gorgeous and rugged wild country is world renowned for its unmatched desert beauty as well as its appeal to outdoor enthusiasts and off road racing buffs. We offer some exciting off road guided tours into the outback of Baja near Cabo San Lucas and the region of Los Cabos. We offer different desert safari tours to suit your preference. If you prefer to kick back and relax and observe the panoramic sights and natural marvels without having to worry about driving, you can climb into one of our four by four Unimogs for a guided sightseeing and wildlife observation excursion. If you would rather drive your own vehicle in a guided caravan, you can drive one of our late model four wheel drive Jeeps. We also offer Hummer excursions to explore the wilderness outside of Los Cabos; check our menu to see details about these Hummer adventures. These safari adventures are not only limited to touring the awe-inspiring wonders in the desert, where you will witness sweeping arroyos, dramatic natural rock formations, rugged canyons, and remote waterfalls cascading into refreshing fresh water pools; our expeditions also explore charming local towns. In these quaint hamlets, you will discover gorgeous Spanish colonial architecture, skilled artisans creating and selling their handmade wares, as well as cultural, historic, shopping, and dining options. You may also journey to the pristine coastal areas and amazing beaches on the East Cape and Cabo Pulmo. Venture out from the vacation paradise of Cabo San Lucas for an exhilarating off-road excursion into the rugged back country of the Baja Peninsula. 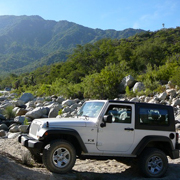 Climb into one of our late model 4x4 Jeeps for a guided adventure into the wilds of the Baja Peninsula. 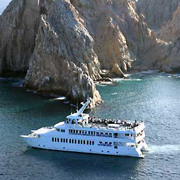 The Caborey Dinner Cruise that offers vacationers an amazing gourmet dinner while cruising through the Sea of Cortez aboard our triple-decker luxury cruise vessel. Youll cruise in style on this dinner cruise; the Caborey is the biggest motorized catamaran in the Cabo San Lucas region.